BioCarbon’s mission is to counteract land degradation by reforesting landscapes at an industrial scale using specialized drones that can restore lands at a rapid pace, firing pods containing nutrients and seeds into the ground. 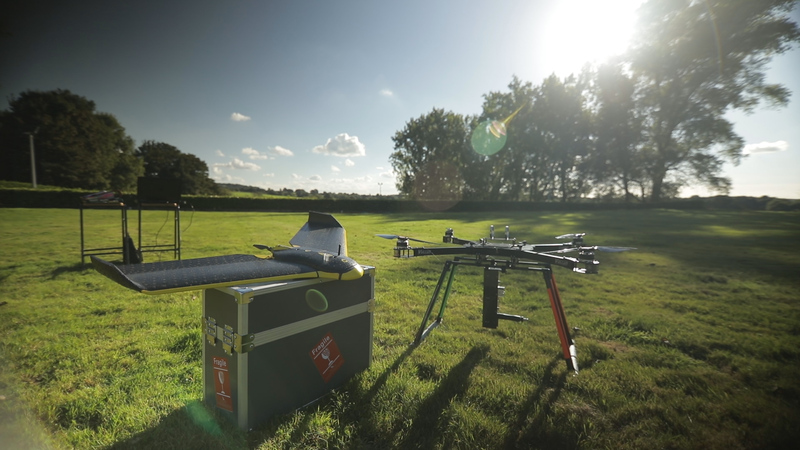 This approach requires innovation—the drone hardware to fire seeds effectively, the mapping software to optimize planting patterns, and the plant science to maximize survival rates and improve biodiversity. That innovation requires investment. So while trees offer numerous benefits to society and the environment, BioCarbon isn’t doing this just to feel good. It recognizes that restoring degraded land is a growing business. The company is currently working on projects in Australia, Canada, Myanmar and the UK. Biocarbon Engineering is one of many companies that make up the expanding restoration economy, businesses that have landscape restoration at the core of their customer value proposition. WRI and The Nature Conservancy (TNC) analyzed more than 140 companies in this space to understand how companies are making money from restoring land. Among these, 14 companies, whose median sales growth reached 100 percent in 2017, are showcased in a new report titled The Business of Planting Trees: A Growing Investment Opportunity. While these companies represent just a small subset of the broader sector, they showcase the diversity of business opportunities. Companies involved in the restoration economy range from early stage, pre-revenue startups to timber funds that manage billions of dollars. Similarly, the goods and services produced by these companies vary widely as well, from biofuels to climate-smart credit systems to green infrastructure. Guayakí reinvented the traditional Argentinian “yerba mate” drink for the American market in the form of ready-to-drink teas and energy drinks. Since yerba mate is best grown in the shade, the company partners with small farmers and indigenous communities in Argentina, Brazil and Paraguay to regenerate the Atlantic rainforest and grow yerba mate under the rainforest canopy. With this market-driven restoration approach, Guayaki reached $60 million in sales in 2017. EcoPlanet Bamboo aims to alleviate the pressure on natural forests by developing sustainable bamboo as an alternative timber and fiber source for major industrial markets, including for toilet and tissue paper, renewable packaging materials for the food and beverage industry, and construction and housing materials. The company has plantations in Nicaragua, South Africa and Ghana, and expects to produce 280,000 tons of raw fiber per year by 2024. New Forests is a Timber Investment Management Organization whose investment strategies include ecosystem restoration in the United States, as well as sustainable forestry in Australia, New Zealand and Southeast Asia. New Forests currently manages $3 billion in timberland assets, with 39 percent of the area managed for conservation outcomes and the remainder used for sustainable timber production. These companies are responding to the global challenge created by billions of hectares of degraded land that cannot provide for a rising human population. Deforestation is a major driver of climate change—land restoration offers one of the best natural climate solutions to fight back. There is strong political momentum, as 39 governments have committed to working toward the Bonn Challenge goal of restoring 150 million hectares of land by 2020 and 350 million hectares by 2030. Companies around the world, including those highlighted in our report, are rising to meet the need to restore degraded land. These enterprises have the potential to deliver profit and impact at scale, contributing to a flourishing restoration economy while also making money for investors. At this critical time when stock and bond markets are at rich valuations and investors are looking for the next growth opportunity, the world’s oldest and most efficient carbon capture technology is waiting: trees. LEARN MORE: Investors, entrepreneurs and others can email us at NRE@wri.org. Note: Camille Rebelo, co-founder of EcoPlanet Bamboo, is part of the Global Restoration Council convened by WRI. EcoPlanet Bamboo had no influence in writing this blog.